A.G. Rhodes Health & Rehab provides expert and compassionate rehabilitation therapy and residential care to seniors in metro Atlanta. As a mission-driven organization, we are guided by what is best for our patients and residents. Their physical, social and psychological well-being is our chief concern, and has been for nearly 115 years. We recognize that there are many relationships that are critical to our success and long-standing reputation as a trusted leader in senior care. Our elders and their families, staff, health care agencies, hospitals, board members, donors, volunteers and the community as whole, are central to realizing our mission. We’re always looking for ways to improve our standard of care, and our unflagging commitment extends beyond providing quality health care. We are equally committed to providing an excellent quality of life for the seniors who stay with us. We offer a homelike environment where seniors are connected to and supported by their families and communities. At A.G. Rhodes, seniors receive the care they need to live well. At A.G. Rhodes, we are transforming our model of care to one that is person-directed and more homelike. Person-directed care is the kind of care that we all want for our loved ones, and for ourselves as we age. It means that first and foremost we consider the elder and we frame the delivery of care according to his or her needs and preferences. Routines are adjusted to accommodate the elder, rather than being based on rigid schedules, or staff efficiency and productivity. It means that choices and actions consider the elder’s unique personality, history and interests, and it puts decision-making in the hands of the elder, or in the hands of those closest to him or her. Our society holds negative perceptions of aging and aging-related illnesses—particularly the stigma associated with dementia—but a person-directed approach encourages us to view aging and dementia through a much different and more humane lens. Through this type of care, we recognize that regardless of age or diagnosis, we are all capable of living purposeful and active lives, and we can all make meaningful contributions. We are dedicated to delivering compassionate and high-quality care to our short-term and long-term elders. While each of our employees has a specific role, such as a Nurse, Certified Nursing Assistant, Activities Director or Laundry Aide, all of our employees are members of a care partnership team. 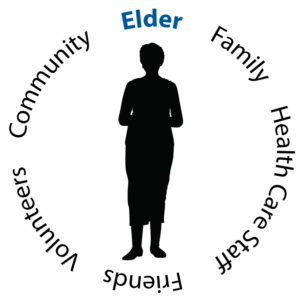 A care partnership promotes the idea that staff, other health care professionals, families, friends, volunteers, others in the community, and most importantly; the elders themselves, are considered care partners who work together to achieve higher-quality care and a more meaningful quality of life. This collaborative and creative approach hinges on the belief that members in the care partnership team are equally involved in the planning and delivery of care. A successful care partnership will use the resources and skills from the entire team to foster relationships which are mutually beneficial and meaningful to all members.